Thanksgiving’s coming! My Thanksgiving checklist follows,”The New Deli Style”. That means I try to efficiently streamline everything to get from “here” (healthy, natural ingredients) to “there” (delicious, flavorful dishes). So far, so good! I grabbed some free-range chickens today; I’ll roast those, and make some stock ahead of time (for perfect gravy). 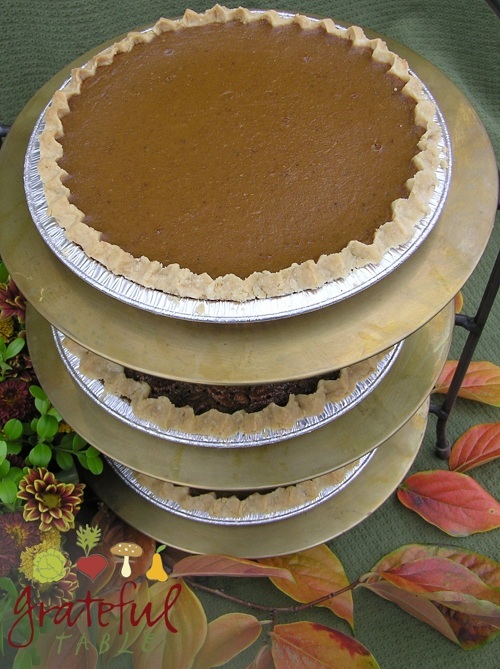 I’ll make some pie crusts too; they freeze so well, so I can do that ahead. I like to bake the pies fresh Thanksgiving morning, but it’s a breeze if the crusts are made already. 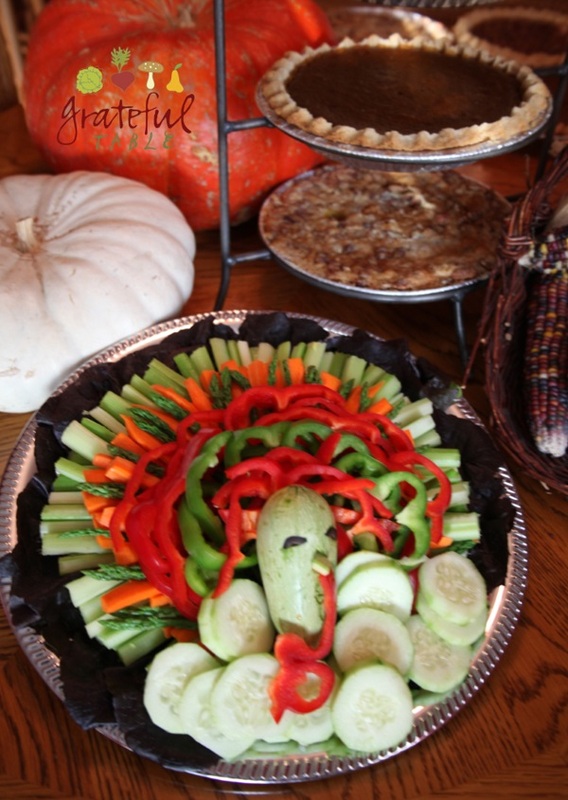 The following recipes are my faves for the holiday meal… maybe they’ll give you some ideas too! 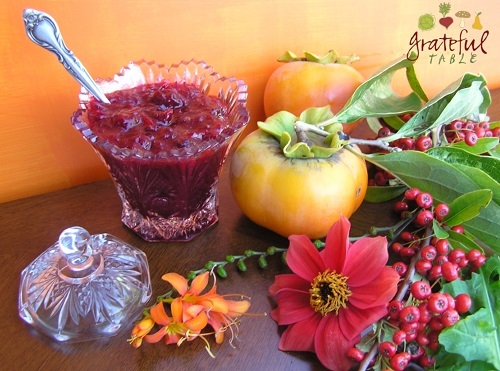 Cranberry Chutney: This can be made days (even weeks) ahead, and keeps quite well. This recipe is similar to the cranberry sauce recipe on the bag of berries, but you can get away with calling it “chutney”, thanks to the addition of a dash of cayenne. (Chutneys usually contain some kind of peppers, and other spices.) A little orange and cinnamon go well in this chutney, too. 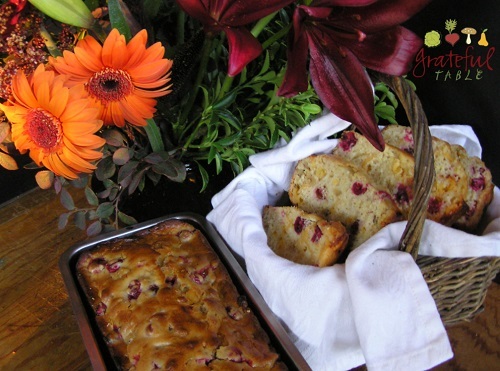 Cranberry Nut Bread: I usually prep the ingredients for this treat the day before, then just add the wet ingredients to the dry on Thanksgiving morning. Makes a great “breakfast”. No, it’s not exactly healthy-style or gluten-free, but it is made with all natural ingredients. So we splurge. It whets our appetite early in the day, priming us for the big meal! Stuffing, New Deli Style: Get creative, add personal favorites: Apple, raisins, sausage, pecans, wild rice, and cornbread… But use a good quality bread (artisan-style or other favorites); packaged dry bread cubes often contain additives like dough conditioners and such. Also avoid real soft, generic, brand-name breads that lack texture- they can deflate into a gummy mass; not what you want. 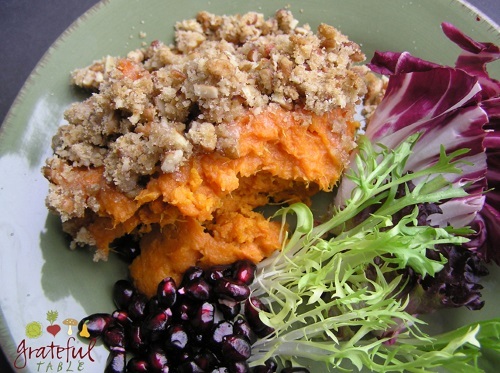 Or try this gluten-free stuffing recipe! “Green Bean Casserole, Healthy Style”: No, this doesn’t have cans of onion rings and mushroom soup in it, but caramelized onion adds depth and sweetness. 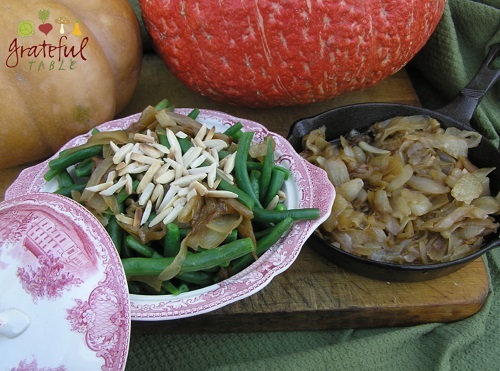 Topped with a few slivered almonds, this is one side dish that won’t stick to your sides! Another plus: the onions can be caramelized days ahead of time. They’ll hold up well and can be stirred into the cooked green beans to serve. Pumpkin Streusel “Upside-Down Pie”: For those of us who don’t want to wrestle with rolling out a pie crust (or by one ready-made), this is a happpy solution. 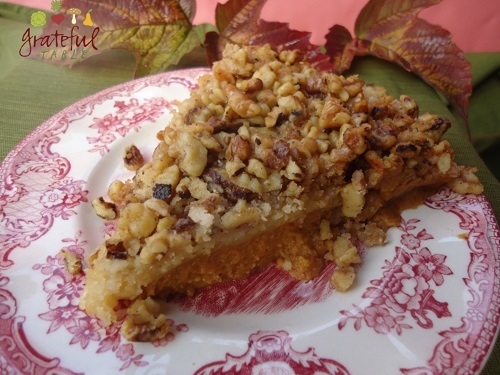 There is no bottom crust, just a nutty topping that is a delicious, crunchy contrast to the smooth pumpkin custard. A personal favorite of mine, especially since this particular recipe uses natural ingredients instead the box-cake mix suggested for other versions of this. 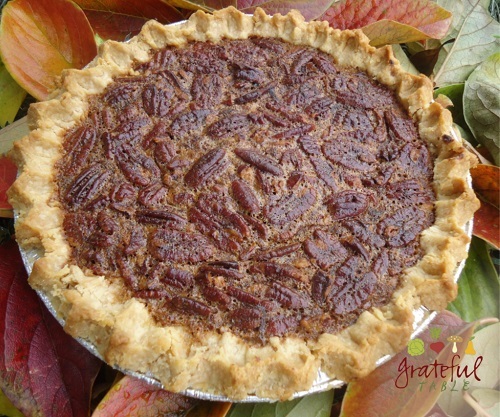 Pecan Pie: I was feeling a bit guilty about the corn syrup in this pie, but the Karo syrup label is assuring me- it’s not high-fructose corn syrup. Cool!! I make two at the same time, which is particularly handy since one bottle of Karo dark corn syrup measures out as the exact amount for two pies. If there is any leftover pie, it keeps well. “Keeping” isn’t an issue in our house though- it disappears fast! 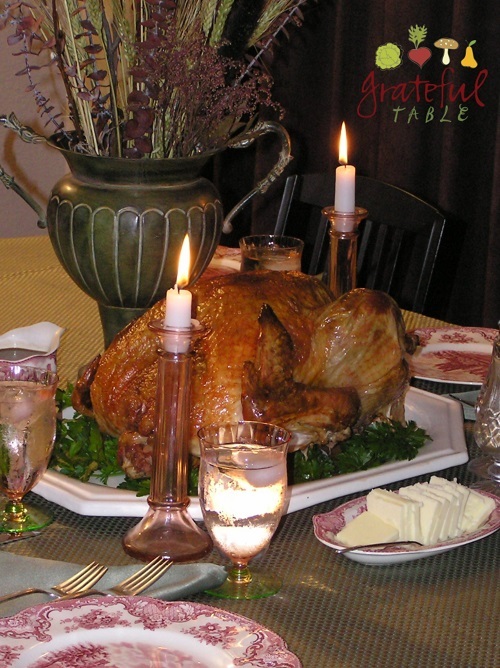 Last but not least is the Turkey Gravy recipe. If you’re cooking a turkey, you can make gravy. There are a few considerations, like if there are overly-done, charred chunks in the roasting pan. In that case, remove blackened parts. Other drippings in the pan should get mixed in with the flour though; they have loads of flavor. 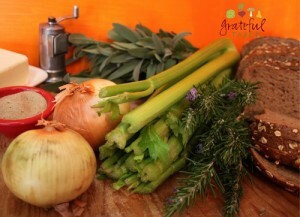 Homemade chicken stock, made ahead of time, is perfect for gravy. But a box of chicken stock will substitute. Above all else, may you gather together together with loved ones. May we all reflect on the many wonderful blessings we have.